The Butler Bulldogs were in town yesterday, and a couple familiar faces attended the game. Butler's former Head Coach, Brad Stevens was in attendance, as was former March Madness-hero and Butler alum Gordon Hayward. The Bulldogs visited a Big East rival, the Providence Friars, at Providence College in Rhode Island. The local team came out victorious with a 70-60 win. From the video above, it seems as though Gordon and Brad didn't sit next to each other while taking in the contest. I wonder why. Maybe to avoid the media explosion that would undoubtedly have come afterward. I at least hope that they carpooled, and saved us all some fumes. Brad Stevens coached the Bulldogs for six seasons, bringing his team to the NCAA Championship twice over that span. In the 2009-2010 championship, Butler faced off against the Duke Blue Devils and lost in the game's final seconds. Some may remember Gordon Hayward's half-court buzzer-beating attempt that was nearly banked in for the win. Duke won with a score of 61-59. Hayward declared for the NBA Draft soon after the National Championship defeat, and was selected with the 9th overall pick in the 2010 NBA Draft by the Utah Jazz, where he would spend the first seven seasons of his career, before eventually signing with the Boston Celtics last offseason. In his two seasons at Butler, Hayward averaged 14.4 points, 7.4 rebounds, 1.8 assists, 1.3 steals, and 1 block per game. In his finals season with the team, he was named Horizon League Player of the Year. 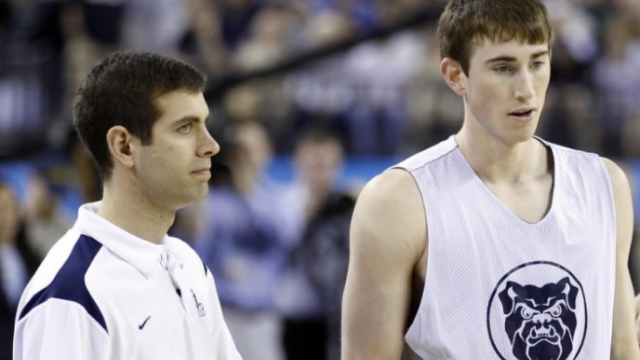 Stevens and his team would again travel to the National Championship game in the 2010-2011 season, sans Hayward. They were led by, now Orlando Magician, Shelvin Mack. Brad would again take the loss, this time in a much sloppier game to the University of Connecticut Huskies. The final score was 53-41, and Butler would finish with the fewest amount of points ever scored in a National Championship game. In Brad's career at Butler, he finished with 166 wins and 49 losses. His style of coaching and faith in 'the Butler Way,' would put the mid-major school on the map in regards to athletics for years to come. #Celtics coach Brad Stevens said Gordon Hayward has begun doing some light shooting, even took free throw at practice to determine whether C's would run another drill - he made it so they did not.